Marine ich is a condition that affects saltwater fish. Although there are some infections that have similar symptoms, ich is a distinct disease caused by a parasitic infection. Porcupine puffer fish are especially vulnerable to developing this disease, and treatment can be difficult. Ich has a number of distinct symptoms. Marine ich (white spot disease) is caused by a parasite called Cryptocaryon irritans. Poor water quality contributes to the spread of marine ich. Puffer fish with this disease have white spots all over their bodies. This condition is itchy, and the fish scratch themselves by rubbing against objects in the aquarium. According to Animal World, ich causes excessive slime, fin damage, a loss of appetite and breathing difficulties. It can also cause cloudy eyes or problems swimming. Ich occurs in four phases. First, the parasite grows and develops on the marine host. The infection shows up as small white spots on the fish. Next, the parasite leaves the fish and sinks to the substrate, where it forms a type of cyst in the bottom of the tank. The cells divide rapidly into hundreds of juvenile parasites. When the parasites hatch from the cyst, they start looking for a new host and continue the cycle. Many aquarium enthusiasts believe the infection is gone when the white spots go away, but the white spots usually reappear and infect greater numbers of fish. According to the Aquatic Community website, most fish with marine ich can be treated using copper, but puffer fish are sensitive to copper and may not survive the treatment. If only one fish is affected, move it to an isolation tank. Change half of its water every day for two weeks to eliminate the parasites. Other treatment methods include adding a medicated solution such as malachite green to the aquarium. Medicated foods containing antibiotics such as Metronidazole may also be used. It is easier to prevent ich than treat it. 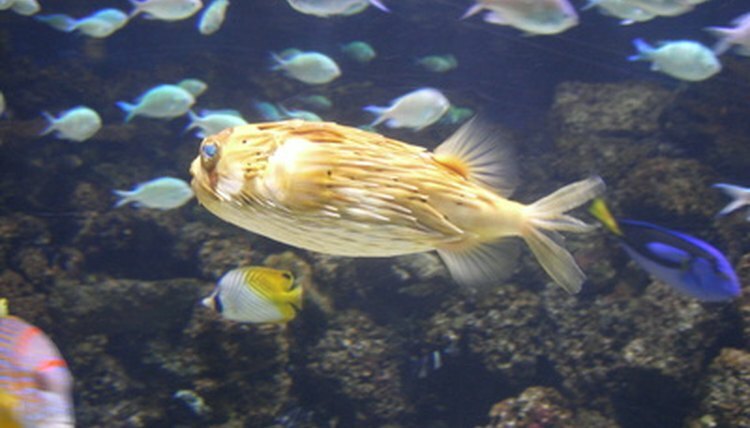 Puffers are harvested from the wild, and when they arrive in the pet store they are often stressed by their new environments. Stress makes fish more vulnerable to disease and infection. New fish should be quarantined for at least a week or two before they are introduced to an existing saltwater community. A quarantined fish that shows symptoms of disease can be treated in isolation. PetEducation.com also recommends keeping the water quality high so that parasites do not have the opportunity to infect the tank.